← Using Vodka to Deodorize Dry Clean Only Clothing Review – Does it Work? Keeping Butter Naturally Soft and Fresh Using a Butter Crock Review – Does It Work? Real butter can be a yummy and healthy addition to a balanced diet. Butter must be kept away from light and air in order to stay fresh. Many people protect their butter from turning rancid by keeping it tightly wrapped in paper and in the refrigerator. Unfortunately, chilled butter becomes hard and is not easily spreadable. 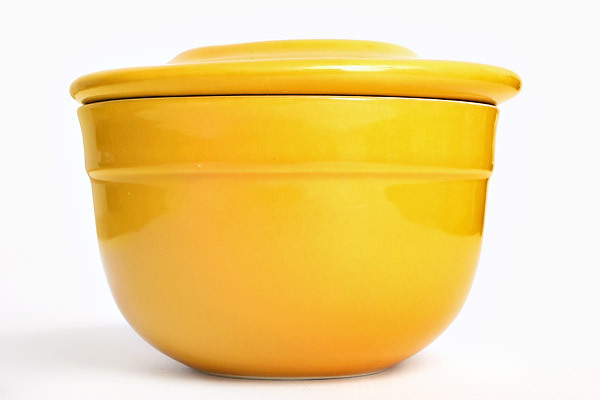 Years ago the French developed a specialized butter dish that keeps butter fresh at room temperature while still protecting it from light and air. A version of this technology is marketed today as the Butter Bell , or the Butter Keeper . Does using a butter crock actually keep your butter fresh and ready to spread? Better for you – no need for the unhealthy but spreadable cold margarine, when you can have soft, spreadable butter anytime you want. You run out of butter faster because you are enjoying more of it! My Butter Crock – doesn’t look like much, but there is amazing goodness inside! Several years ago our family switched from margarine and “spread” to real butter. It turns out that real butter is all natural, and can be a healthy alternative to margarine (who knew?). It also tastes sooooooooo good, especially when softened and spread on fresh baked goods. The only down side is that butter from the fridge is hard as a rock and difficult to spread. I was always forgetting to take it out from the fridge to soften before my toast or muffins were ready. When I was given a gift card to a fancy kitchen store, I jumped at the chance to get a french butter crock. I had been told by a friend that this was the kitchen tool you needed if soft butter was your thing (and it is totally my thing!). The crock is basically two bowls that interlock. 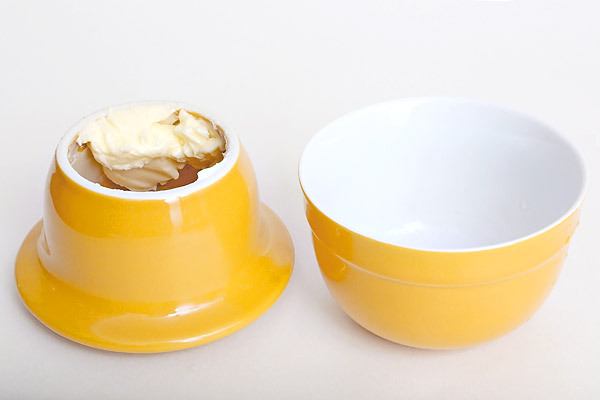 The butter is packed into the smaller bowl then inverted and placed into the larger bowl, which has a small bit of water in the bottom. The water seals the air away from the butter and keeps it fresh for up to a month at room temperature! Soft, fresh butter ready to go! I started using my butter crock the day after I bought it and I haven’t looked back. It works great! My butter is always soft and fresh and taste amazing. When ready to fill, I leave a couple sticks of butter out on the counter for a few hours until soft. Then I carefully pack the butter into the top of the crock, making sure to save the wrappers for reuse. A quarter-inch of water in the bottom of the crock is all I need to keep it fresh. I store it on a convenient shelf in my kitchen, out of direct sunlight. Any time I need butter, I scoop it out with a knife and refresh the water before replacing the top of the crock. I’ve heard the butter can last up to a month with regular water changings, but we go through a full crock every couple of weeks at our house. I then fully wash the crock and let it dry before filling it back up again. Have you ever tried a butter crock? Do you have another kitchen thing you can’t live without? This entry was posted in In the Kitchen, Real Food and tagged better for the earth, better for you, butter, cooking, kitchen, real food, saves time. Bookmark the permalink. 40 Responses to Keeping Butter Naturally Soft and Fresh Using a Butter Crock Review – Does It Work? I keep mine in a sealed cheese crock…one stick at a time lasts a week. got it at a thrift store. no problems. Hey Dea, I’m not sure what a cheese crock is. Can you tell us more? I have heard of butter crocks before, but I always just thought they were for pretty presentation of butter! Lol. No idea they served an actual purpose. This is great to learn. I mostly use butter on hot vegetables and meats at the moment so don’t really have a need for something like this, but I can see it being useful when we go back to eating bread. Thanks for sharing. Hey Athena – the link above has the best price I’ve seen at $9.99. We just keep the butter in a ceramic dish with plastic lid (Corningware) on the counter. No water. We put in more butter whenever it’s getting low, unless it is starting to seem at all less-than-fresh, in which case we put the new butter in a clean dish, use up the old, and wash the old dish–this happens only once a month or less. It’s easy. But we live in Pennsylvania. I grew up in Oklahoma, where butter with air around it in a covered dish at room temp grows mold within a few days. There’s simply more mold in the air there, as I understand it. I imagine the local weather has an effect. It’s dry and relatively cool year round where I live. Just a warning with the butter crocks. Last year the pump on my swamp cooler died, and all I had was a glorified fan. It was 110 outside and around 90 inside. The butter in my butter crock lasted a grand total of 2 days before it was very rancid and terrible tasting. I thought it was just that batch of butter, and cleaned out my crock and refilled it, with the same result 2 days later. So they don’t really work if it’s exceptionally hot. My friends and I all love soft butter, so I followed your link and perchased several for us. Thanks for the lead. I didn’t know about this product before reading your blog. I so want one! Next time I have a gift card, I want to spend it on this! I always prefer to use butter instead of margarine too, both for spreading and baking. Your butter crock sounds wonderful – I will have to see if I can get hold of one! Where is the yellow crock from? I like that it has no handle on the top. The one with the handle looks a little unsteady–it wouldn’t last a week in our house! Hi Kimberly, I got mine a Sur La Table. But if you search for “butter crock” on amazon you can find lots of different styles that might suit you better. It’s true – you have to change the water regularly. But since I use mine almost every day, it’s really no big deal to dump the few tablespoons of water and refill. It’s as simple as rinsing it out, and totally worth it for fresh, soft butter whenever I want. Oh, I must agree….Never saw one until I watched a dude making a potato recipe on youtube…..He had one, praised it a bit, and I now have 4 different ones in my Amazon cart…. sweet…I leave butter out now, but in Florida, I think this will be a nice addition. Can’t wait for them to arrive..I just use a saucer now and cover which is fine as butter doesn’t last long around here, but it is not as pretty as these, so looking forward to their arrival !! I have owned a butter bell for years, and love it. I only wish it held more content then one stick of butter. One is not enough at my place when I have company for any length of time (few days at a time) A couple of years ago, I was at a Renascence fair, and I enjoyed the shopping a lot. I came across some pottery a woman made and saw something similar to my butter bell, but a lot bigger. I asked her about it and she called it a “French butter keeper”. I commented to her how it is the same idea of my butter bell, but much bigger, and that I needed one of hers too (her version held 3 sticks of butter at once!). That woman asked me “What’s a butter bell?”. I’ve never had any undesirable issues concerning butter turning rancid with either the butter bell, or the french butter keeper, and I appreciate not having torn up toast first thing in the morning. I highly recommend the use of a butter keeper. I also bought mine from a lady selling pottery she makes. It is wonderful… she taught me to put alittle ice in the bowl, it seems to stay fresher and I only change the water once or twice a week. I just stick it under the ice dispenser in the fridge and let a bit of crushed ice fall in and add a bit of water! Keeps it cool and soft!!! I have used a thick walled butter crock with lid for years. It does not use water. I do use it all year long and it sits on kitchen counter. Holds 2 cubes of butter at a time. In the warmer months I clean it before adding fresh butter. I have never had butter go bad to date. I live in Southern Oregon and it gets warm in July and August but not very humid. So great. Our butter turns green in our butter crock. What do you think would cause that? Not sure Steve. Maybe mold? Are you changing your water every day? where do I buy the butter crock which requires no refrigeration? I have a problem keeping my butter soft at “room temperature”. We go through a stick of butter every 4-5 days and never have a problem with it going rancid. Instead, the butter remains un-spreadable because the air temperature in the winter in my kitchen is not warm enough, especially in the cooler cupboards. Even in a covered dish on the counter it remains too hard but we don’t like having things sitting on the counter. So I’m looking for a butter dish that keeps butter perfectly spreadable and fresh, regardless of the room temperature or time of year – and doesn’t require changing water. Hey Ken! I moved from Los Angeles to the NorthEast US this winter, and I’m having the same problem! We ended up leaving our butter crock on the counter, snuggled up to the back of the fridge for that touch of warmth. Putting it near the pilot light of a gas range may also do the trick. I’m not aware of any “heated” butter crocks available in the US, although the internet says there may be one for sale in the UK. I also read once of a heated butter knife proposed by another UK company, but I’m not sure if it ever went into production. Sorry to hear about your relocation, Victoria. I just read of a refrigerator in New Zealand that has a heated butter compartment. I wonder what the shipping costs are? I also did some research and one article said “normal’ butter becomes spreadable at 60F but I don’t think that is accurate. Maybe Canadian butter (I am in BC) is more resistant to softening but I would wager the temperature needs to be about 70-75 to make it friendly to fresh bread. I am contemplating inventing a battery-powered butter dish that is kept in the fridge. It might work. Or another idea that popped into my head is a way to ‘cream’ hard butter under pressure through a cake-decorating nozzle. Would that transformation make it spreadable before it ‘set-up’ again? I may have to test that theory. As someone who lives in NZ I grew up with a fridge that had a butter compartment that you could set to different temperatures. I am struggling at the moment as the fridge my husband bought before we were married doesn’t have one! I understand that you can buy them as an extra and they just click into a plug piece at the top of the fridge (in my case the top left) under the fridge temp controls. I found one in my grandma’s garage when we were clearing up but alas, its for an older model and doesn’t fit mine! I have never liked marg and generally just leave some butter on a saucer in the pantry. Hubby did some reading yesterday and decided he is not eating it either and pulled up your blog for me to read. I don’t think I could be bothered replacing the water every couple of day and I KNOW that he wont..
you can mix butter with a pure oil, I prefer coconut oil. Then, you can keep it in fridge in a jam jar, or such. oh… it is spreadable this way. i ditched margarine probably in 2007 or 2008. My Dr said my cholesterol levels were higher than the year before but still safe. He told me to cut down the usual enemies and then said “And switch to butter ditch the margarines.” I thought my Dr missed a day in med school and mentioned butter is an animal product, animal fat = cholesterol, so kinda contradicts the cut out animal fat thing. He said it was better b/c its natural (duh) so yes if I ate lbs of the stuff we would have problems but natural is better than chemical. Gotcha! Shortly after my switch to butter for everyday use, I used it for company or baking, I found a butter bell (I guess that is what we call them in Canada) and have never looked back. All my immediate family members have bought bells after my praises. I buy fancy/pretty ones as gifts now. I’ve always just taken a small tea plate and kept it on the counter with a stick of butter on it. No cover, no crock, no water. Its always available and soft. When the stick is gone wash the plate and get another one out. How long does it take the average person or family to go through one stick of butter? I’ve had it out for a week and never had it go rancid or bad even in hot weather. I just bought a butter keeper at an estate sale for $3. Can’t wait to try it. Buttered toast is one of my favorites, and I’ve gotten very good at shaving paper-thin slices off the cold, hard brick so they will melt, but it’s a lot of work. Regarding soft butter, my mother used to take butter, let it sit out to soften it, then blend it with olive oil. Then she would pack it into an old butter or margarine tub. It was soft and spreadable right out of the fridge, and healthy. I haven’t thought of this for years, maybe I’ll try it.